I am not someone who likes to have a lot of useless kitchen gadgets and tools cluttering up my cooking space. So, imagine my surprise and delight at finding a countertop pizza oven that actually makes excellent, restaurant-quality pizzas. I was initially suspicious of the New Wave Stone Bake Pizza Oven. 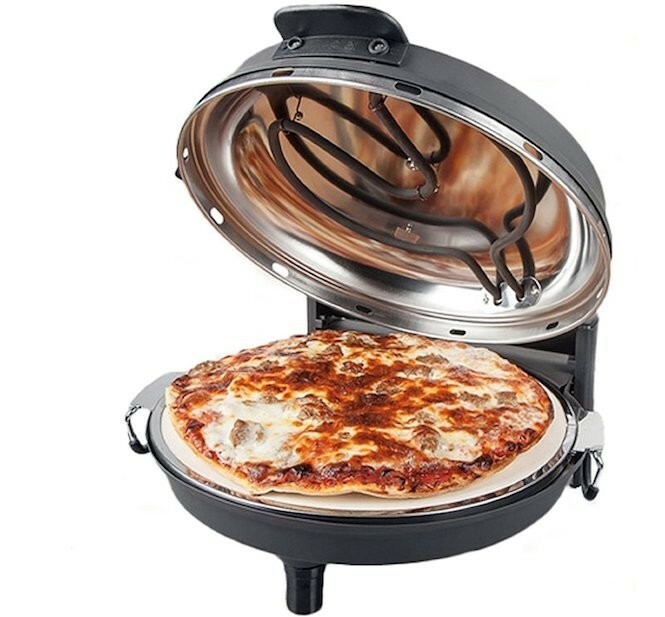 It's lightweight and, frankly, looks sort of like a Foreman grill for pizza. But, renowned food writer John Mariani—who is an authority on Italian food—was very impressed by this pizza oven and featured it in his weekly online newsletter. So I decided to buy one and take it for a spin. I found the pizza oven at Best Buy, where it was on sale for $79.99 (it normally retails for $99.99). The oven comes with two metal pizza paddles that are perfect for placing pizzas on, and removing from, the hot stone. 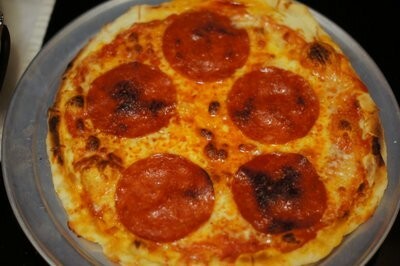 The oven cooks single 12-inch pizzas (I wish they made a bigger model for larger pizzas). Now, normally, I cook pizzas at home in my regular oven, which can only reach 550 degrees and can take a half hour to reach that temperature. This little pizza maker goes up to 700 degrees and takes about five minutes to get there. It has a removable (for cleaning) pizza stone that sits above an electric coil. There's another electric coil in the top of the lid. After it heats up, you simply put your pizza on the stone, close the lid, raise the temperature, and the pizza cooks in about four minutes, depending on thickness. Best of all, it comes out bubbly, crispy and slightly charred, like a wood-fired or brick-oven pizza. I made a pepperoni pizza for my stepson and he declared it "better than Domino's," which is high praise coming from a teenager. Please rest assured; I was not paid for this endorsement. I bought the pizza oven with my own money and I just love it so much I wanted to share it with you. The New Wave Stone Bake Pizza Oven would be a great holiday gift for the pizza lover in your life.